Roger DuWayne Jacobsen, 83, of Columbia Falls, Montana, passed away peacefully on November 26, 2018. Roger was surrounded by his family at the time of his passing. Roger was born in 1935 in the prairie country in Golden Valley County North Dakota to Oswald and Mable (Roppe) Jacobsen. Roger was employed by Columbia Falls Aluminum from 1968 to 1997, serving as an industrial electrician for many of those years. Prior to moving to Columbia Falls, Roger and his family lived in Glendive, Montana, where Roger worked for Northern Pacific Railroad for 11 years, resigning in 1964. Roger also owned and operated his own carpet installation business while in Glendive. Roger was well known for hobbies that were his passions including music, lapidary, fossils and faceting gems. He started playing music at age 15 and hitch-hiked his way around the country competing in local talent shows, which were popular at the time, and playing wherever there were a few dollars to be made. 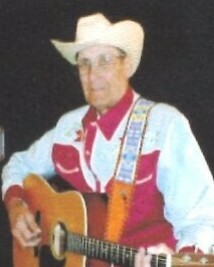 As a young man, Roger, along with fellow musician and life-long friend Archie Bott, played county fairs and clubs. Roger and Archie even recorded a few records. He performed all of his life, most recently with The R.E.K.’s, a band of Roger and friends. Roger and Jean were regulars at Pasture Pickin’ blue grass festivals. Jean said “I had the pleasure of listening to Roger’s music for the last 65 years and I enjoyed it as much the last time I heard him play and sing as I did the first time.” Roger was a passionate rock hound. He and Jean hunted for agates, and mined for sapphires and other gems. He cut and faceted their findings and crafted jewelry and other items from these. He was also an avid gardener and fisherman. Roger had many natural talents and was a life-long learner of many subjects. He was a larger than life character. Always authentic, he was welcoming and accepting of visitors, a lively story teller, and a great conversationalist. Roger is survived by his wife of 65 years Jean Jacobsen; children Ramona Bell (George Jorgenson) of Columbia Falls; Dale Jacobsen (Sheri) of Whitefish; and Merna Jacobsen-Blank (Andy) of Longmont, Colorado. He is also survived by siblings Clifford Jacobsen of Chandler, Arizona; Velma Eastwood of Portland, Oregon; Euphie Eallonardo of Rancho Palos Verdes California; Vernie Jacobsen of Billings, Montana; and several nieces and nephews. He is preceded in death by brothers Kenney, Richard (Zeke), and Kermit (Buddy). A private graveside service will be held. A celebration of life is scheduled for Summer, 2019. Columbia Mortuary is caring for Roger’s family.